The work of foot and ankle surgeon Nicholas Giovinco blurs the line between art and science. Giovinco is an assistant professor in the Division of Vascular and Endovascular Surgery in the UA Department of Surgery. He's also director of education at the Southern Arizona Limb Salvage Alliance, or SALSA, a UA College of Medicine clinical and research team that's advancing diabetic foot care and preventing amputations. 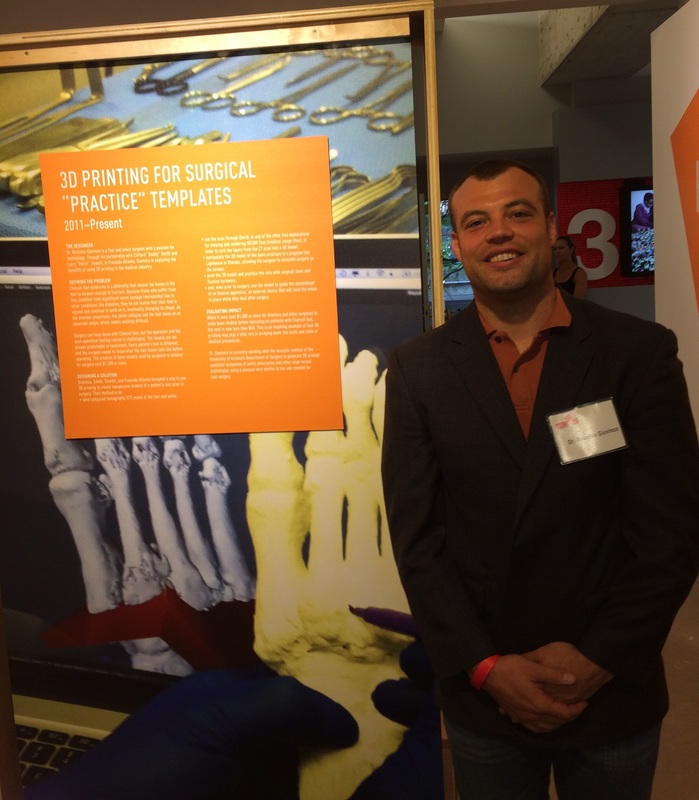 To help podiatric surgeons prepare for complicated procedures, Giovinco created a set of 3-D-printed templates, derived from CT scans of foot and ankle deformities. The templates are meant to help surgeons prepare for procedures sand minimize the amount of thinking they must do on the fly. "Before you go into surgery, you need to have a game plan together," Giovinco says. Giovinco's template project was published in The Journal of Foot and Ankle Surgery. He was then contacted by the Museum of Design Atlanta, which offered him a spot in the museum's "Design for Social Impact" exhibition, which shows how design can improve our lives. His project is featured in the exhibit, which runs through Aug. 3. Made in collaboration with the nonprofit workspace Freeside Atlanta, Giovinco's templates show the ravages of diabetic complications like Charcot foot, which causes bone weakening and often requires surgery. Many patients with the complication are unaware that anything is wrong. "These people have lost the gift of pain," Giovinco says, referring to a condition know in the medical world as neuropathy. Giovinco likens Charcot foot surgery to "taking a house that's been demolished and putting it back together – piece by piece." It's a tricky process that's made easier by the 3-D templates, which have led to better patient outcomes and care, and less stress on surgeons. The templates have been used in computer simulations and hands-on practice of various surgical techniques. In this YouTube video, this looks like trial and error, and that's the point, Giovinco says. He says the idea is that doctors arrive at the best solution to their patient's problem before making an incision. To SALSA director Dr. David Armstrong, 3-D templates are nothing short of game-changing. "We've used them extensively," he says. "This is what the UA is all about – interdisciplinarity." Three-dimensional templating is rapidly spreading beyond podiatric surgery. Armstrong cites a group of neurosurgeons that is using the technology to model complex bony structures at the base of the skull, an innovative journey Armstrong calls "going from toe to head." 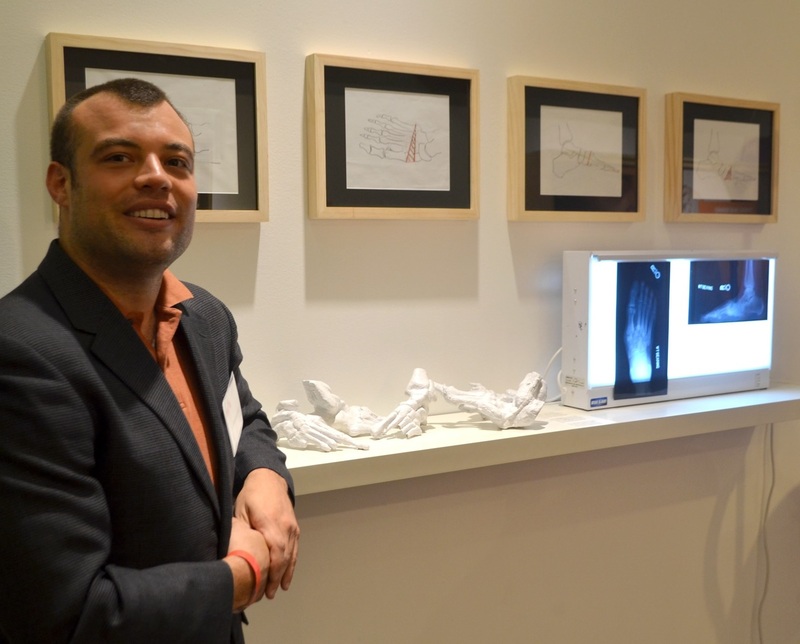 Giovinco has become a champion for medical 3-D printing. With open-source hardware and software and other free tools, he says that this process can be made readily available to facilities throughout the world. He's now working with surgical colleagues in a variety of fields. Giovinco also is engaged in creating a "medical makerspace," a venue where medical and biotech researchers can develop technologies ranging from wearable sensors to printed body parts. You can see Giovinco's 3-D design work on www.thingiverse.com/DrGlassDPM and his medical illustrations at www.youtube.com/user/DrGlassDPM.